Why Choose Michigan for Your Cardiovascular Care? Cardiovascular disease is progressive, and takes a different course in each and every patient. That's why it's important to make sure you or your loved ones get the best possible care right from the beginning - from the University of Michigan Cardiovascular Center. The University of Michigan Samuel and Jean Frankel Cardiovascular Center is a nationally recognized leader in the diagnosis and treatment of heart and vascular diseases. And while we're known for our ability to handle the most advanced cases, we'd really like to keep yours from becoming advanced in the first place. Here, our team of doctors and researchers who make huge advances in medicine are the same ones who work with you to make sure you get the most advanced treatment. 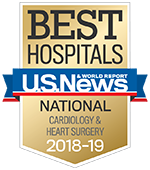 The 2018-19 U.S. News and World Report's Best Hospitals report positions the cardiology and heart surgery programs at the University of Michigan as nationally ranked at #8, along with 9 other adult specialties ranking in the top 10. We offer nationally known programs in heart failure, heart transplant, stroke, children's heart disease, valve surgery, implanted heart-assist devices, heart rhythm disorders, preventive heart care, and vascular medicine and surgery. Our team approach ensures patients are exposed to specialists in their condition, leading to an early, accurate diagnosis and comprehensive care—from treatment to follow-up. We help more than 40,000 patients each year, which means patients in our hands receive world-class experience. Our surgeons and interventional specialists perform procedures that no one else in the region performs. Our clinical facility was designed with you, our patient, in mind. Easy access, a sweeping architectural design filled with natural light, a healing garden and meditation room are just some of the features promoting a holistic healing experience; one that begins the moment you walk through our doors. We also offer care at convenient satellite locations. Other hospitals have chosen to partner with us to help provide specialized care in their area. Our convenient toll-free number, 1-888-287-1082 gives you access to our full range of services, and offers the chance to ask nurses questions about cardiovascular care. Our emphasis on research means our scientists and physicians work together to provide the most advanced care, and our patients have access to innovative new treatment options. We’re totally committed to ever-improving quality in the care we provide. We also lead a number of regional and statewide quality-improvement projects that are helping all Michiganders. View the latest University of Michigan Activity and Outcomes Report, which is a summary of the data from all of our treatment areas, as well as information on innovative technologies and research initiatives. 30-day survival: Excellent. Survival 30 days after being admitted relative to other hospitals treating similarly complex conditions. Patient safety: Above Average. Ability to prevent four types of accidents and medical errors across the hospital. Number of patients: Very High. Relative volume of high-risk patients treated for cardiology-related disorders over three years. Higher volume is associated with better outcomes. Nurse staffing: Excellent. More nursing care per patient is associated with better outcomes and better patient experience. Patient services, like programs for cardiac rehabilitation and hospice: Excellent. Advanced technologies, such as specialized imaging technologies and transplant services: Excellent. See the U.S. News & World Report score card for cardiology and heart surgery.